Time for round three of Akosa vs Menchaca, as the series is even at 1-1 for the day: Akosa holding off Menchaca in the 4×100 anchor leg for the win, and then Menchaca pulling away from Akosa during the 100m final for the win. How will the men’s 200m final go? 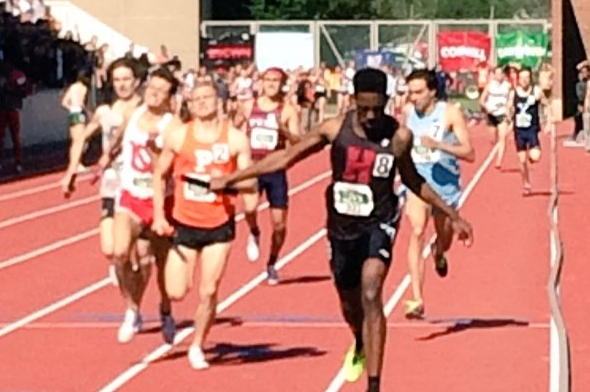 Akosa had the edge afte rhte first 100m but Menchaca pulled away… but another Cornell athlete spoiled the party – Larry Gibson slid in to steal the win over Menchaca as both went under 21 seconds – 20.96 and 20.99. We believe this is the first time that two athletes went sub-21 in the 200m final. Akosa was third in 21.09. Cornell got 22 points in the event, pulling away from Princeton who only got 6 points in the event. Harvard’s Gabrielle Thomas easily earned her second individual win of the day by winning the women’s 200m final in 23.38 – a new meet record by 0.27 seconds. Thomas had the race in the bag 50 meters into the race. Cornell junior Adrian Jones also went sub-24 for a new personal best, running the seventh fastest time in meet history and conference history. Penn’s Taylor McCorkle finished in third with a new personal best by 0.02 seconds – 23.96. After a few hours, the decathlon pole vault has finally wrapped up. Dartmouth’s Nico Robinson got the best clearance of 15-00 1/4 to get 784 points. Dartmouth rookie Benjamin Ose finished in second place with a height of 14-08 1/4, while Cornell’s Austin Jamerson was third with 14-04 1/2. Jamerson still leads the overall decathlon competition with 6060 points, while Robinson closed the gap as he has 5995. Ose moved into third ahead of Harvard’s Mark Hill – 5580 to 5527 points. The men’s 5000m had 31 entries on the start list, but the headliners are defending champion Thomas Awad of Penn, Outdoor Heps 10k champion Ben Rainero of Cornell, steeplechase champion Nick Tuck of Penn, Brown’s Will Sheeran, Dartmouth’s Daniel Salas, Harvard’s Brendan Price, and Indoor Heps 5km champ Joey Chapin of Dartmouth. Salas was the early leader, with Rainero-Awad-Sheeran-Price sitting in second through fifth as the group went through 1600m in 4:35. The top 5 order has not changed as the group passes by with 6 laps to go. Chapin sits in sixth place with 6 laps to go. Salas moved out into lane 2 and drops out with 5 laps to go, and the leader is now Rainero, who promptly slows the pace to 72 seconds for the lap, possibly making it a kicker’s race in the final lap. Top three were Rainero, Awad, and Sheeran at 4 laps to go. Three laps to go and Princeton’s Jeremy Spiezo takes over the lead and Awad moves to the outside lanes to regain position on Spiezo’s shoulder. Two laps to go in 12:15 and Rainero-Awad are even for the lead. Awad fell with 500m to go after getting tangled up with another athlete, and Rainero is the new leader. Chapin tripped over Awad and fell. Sheeran is on the outside while Columbia’s Mark Violone is in third. Both Awad and Chapin get back up and attempt to get back into the race, but Awad dropped out with 300m to go. Sheeran and Rainero battle it out on the final lap and are even going into the final 100m. Rainero sprints away at the top of the final 100m and takes the distance double with a 57 second final lapin 14:17.26. Columbia’s rookie Brian Zabliski found a final gear and sprinted past Sheeran to take second place. After the race was done, Awad ran up to Rainero and hugged him, showing an ultimate sign of good sportsmanship. Chapin recovered to finish in fifth place. Harvard’s Nikki Okwelogu extended her shot put reign for another year as she won by 12 feet, 56-03, just shy of her record that she set last year. She also won the discus title yesterday in a new meet record. This win secures the team title for Harvard for the fourth year in a row. So the internet decided to rebuffer my webstream at the start of the women’s 5km, and I cannot do a play by play of the race at this time. 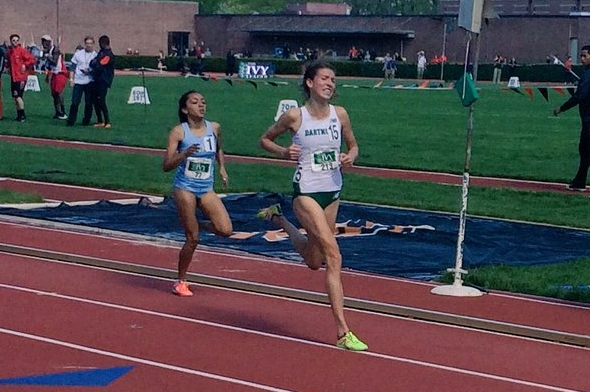 But from what we can tell on Twitter, there was a tight front pack of five women at the bell lap which included Dartmouth’s Dana Giordano. Giordano – who won the 1500m earlier in the day – used her 1500m speed to outkick the field late and grabbed her second individual title of the day in 16:33.39. Columbia’s Henna Rustami did her best to keep up with Giordano and got rewarded with a runner-up finish, 16:33.92. Columbia also got third place with Natalie Tanner in 16:36.69. Giordano became the first Ivy woman to ever win the 1500m and 5000m in the same championships. In the decathlon, Penn’s Luke Krouse won the javelin throw with the best distance of 179-10, being the only athlete to go farther than 170 feet in the competition. Knouse winning the event did not have a major impact on the overall standings as Cornell’s Austin Jamerson still leads (6624) and is expected to win the Outdoor Heps title over Dartmouth’s Nico Robinson (6425). Dartmouth’s Benjamin Ose widened his lead over Harvard’s Mark Hill in the battle for third place – 6193 to 6001. The 1,500m remains for these men. Harvard managed to grab the Outdoor Heps 4×800 title to go with their Indoor Heps 4×800 title from this past February. They were near the back of the race for the first two legs, but a strong third leg by Thomas Negron brought them into second behind Princeton going into the anchor. 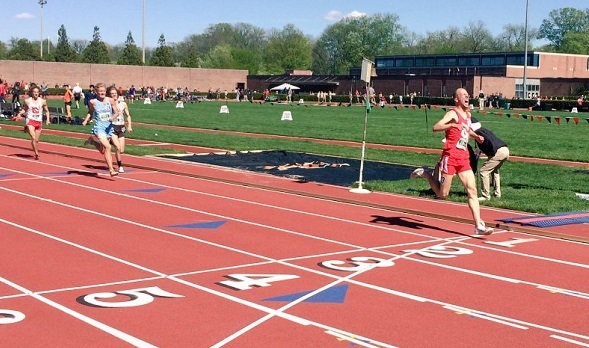 there, Myles Marshall ran sub 1:50 to pass Princeton’s Luke Brahm to take the lead and the win in 7:28.04. Princeton was second in 7:28.75, edging out a late charge by Cornell’s James Gowans as Cornell finished in third with the same time. In the women’s 4×800 relay, Columbia defended their title with a sub-2:10 anchor leg by Sarah Hardie – the only sub-2:10 clocking in the entire race – to pass Princeton on the anchor leg. Columbia won in 8:44.10 to Princeton’s 8:45.21. Cornell’s Austin Jamerson gave his team another 10 points by winning the decathlon with a new personal best score of 7161 points. Dartmouth got 14 points from Nico Robinson – who flirted with the 7000 point barrier with 6997 points – and rookie Benjamin Ose, 6754 points. Princeton’s Byran Oslin had a great final event, the 1500m, to move into fourth place (6575) and passing Harvard’s Mark Hill (fifth – 6409 points). Penn’s Luke Krouse rounded out the scorers with 6182 points. The triple jump is the only remaining individual event for the men. Cornell also claimed the final men’s track event for the day – the 4×400 – but in a more nail-biting experience than in the decathlon. Tobe Attah had to run down Outdoor Heps 400m champ Marc-Andre Alexandre of Yale on the anchor leg, who had about a 0.2 second lead going into the final leg. Attah ran a 47.2 split to Alexandre’s 48.2. With this win, Cornell broke the 200 point barrier – a first in Ivy history. And they can expand upon that with the results of the men’s triple jump! And Cornell does, as Bobby Plummer got a huge new personal best in the triple jump to secure the win – 52-05 1/2, wind-aided – over Harvard’s Efe Uwaifo (51-09 3/4). The women’s field events are complete now that we have the high jump results. Dartmouth’s Kaitlin Whitehorn earned her third Outdoor Heps high jump title by clearing 5-10, fighting off a pair of freshmen – Brown’s Nicie Jennelle Grier-Spratley (2nd – 5-07 1/4) and Cornell’s Kate Gulbrandsen (3rd – 5-07 1/4). The final event for the women is the 4×400 relay. Since Princeton has Cecilia Barowski running their anchor leg, the rest of the field would need to make sure that they had a good distance ahead of the Lady Tiger squad before Barowski got the baton if they wanted a chance to win the race. But Princeton made sure they got the baton to Barowski in the lead as Meghan McMullin did on her third leg. Barowski brought the baton home for the win in 3:42.98. This entry was posted on Sunday, May 8th, 2016 at 2:24 pm. It is filed under Heps Champs, Spotlight. You can follow any responses to this entry through the RSS 2.0 feed.